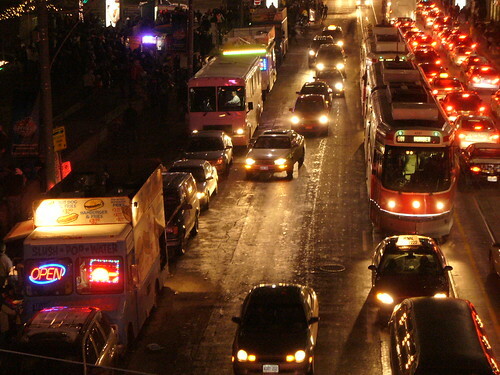 A Toronto light rail vehicle in mixed traffic. If you don’t believe me, just do a search for “hate” and the name of your favorite transit agency on Twitter. You’ll see what regular people are saying about service in Chicago, San Francisco, Washington D.C. and New York City. Yet when I’m in these cities I’m usually seething with jealousy and already thinking about which of the many quaint transit-oriented neighborhoods I’m going to live in. But it seems lately there’s been an awakening among transit advocates as they take a look at the things L.A. has been doing with transit in the last 20 years. In fact, in recent days there’s been a small flurry of blog posts from transportation types in different cities around the nation who have turned their eyes to L.A. and come to the somewhat surprising conclusion that we are doing things right over here — and that their respective cities should look to L.A. for inspiration. Granted, here at The Source we often try to highlight the things we feel Metro is doing to be leaders in transit but we also expect a healthy amount of skepticism from our readers since, hey, we’re on the agency’s payroll. And while we hope you trust us for honest and candid news and views (after all, I made the choice to get around using only Metro well before this blog was born) it’s refreshing to hear this type of stuff from completely independent outside sources. The Oakland blog Living in the O took a recent trip to L.A. after a nine year absence and was amazed at the number of new transit options, and more importantly, the difference in public perception of transit in the city. The blog came to the conclusion that Bay Area agencies could learn a thing or two from Metro when it comes to marketing their systems. The blog’s perspective on marketing was influenced not only by personal observation, but also by a fantastic video and blog post put together by The City Fix blog about Metro’s marketing efforts (we had a short blurb about it in the headlines last month). Dan Reed at Greater Greater Washington, a D.C. area blog, sets his sights on the success of Metro Rapid after taking a trip to L.A. He noted the speed, convenience and ubiquity of Metro’s 24 Rapid routes compared to D.C.’s rather meager two line MetroExtra, the area’s own attempt at rapid bus service. Dan was also enamored by Metro’s marketing, taking special notice of the color-coordinated buses and even going so far as buying a souvenir from the Metro Store. Andrew Barton of the Toronto blog Acts of Minor Treason has written an incredibly comprehensive look at Metro Rail from an non-local perspective. His essay is seriously a must read. Toronto is a city that is regularly considered one of the most livable cities in the world and yet Andrew very earnestly calls Metro Rail “the first truly modern transit system I’ve ever ridden”. He marvels at the fact that in less than 20 years Los Angeles has gone from zero miles of rail to 79 miles distributed over five lines and seventy stations. In the same time period Toronto has added one stop to an existing subway line and added one new 3.4 mile subway line to the system. Andrew also notes that Metro’s fares — $1.25 for a one-way trip — are the lowest he’s ever seen. To put things in perspective, the Toronto Transit Commission charges $3 for a single ride, $10 for a day pass and $121 for a monthly pass. He even likes the much maligned TAP card. Of course, Andrew’s lengthy dissection of Metro Rail is not all roses. He brings up the restrictive nature of one-way tickets (one ticket, one line), the lack of staffed stations and the relative infrequency of rail service even during peak hours. In Toronto, trains run every 2-3 minutes during rush hour and no more than every 5 minutes outside of rush hours. And his criticisms are as welcome as his compliments. No one’s here to say Metro is perfect and that riders have nothing to complain about — quite the contrary, and constructive criticism is always needed to keep the agency striving to improve — but these stories from outsiders sharing their honest opinions serve as a good reminder that maybe things aren’t so bad. Maybe we even have the right to feel a little proud for what we’re doing in our neck of the woods, especially considering that L.A. was once looked at as the ultimate example of how not to do things. Tagged as: Bay Area, marketing, Oakland, Toronto, Washington D.C.